Rather than only giving a 1 to 5 rating of cards that none of us have played much yet (which gives a higher impression of accuracy than is appropriate for an unplayed card), I am also going to rate each card’s uncertainty. Double Time, as a whole, is EXTREMELY powerful, especially on the corp side. Any lists out there of which data packs to get first will be advised to put Double Time near the top of the list, if not at the top! 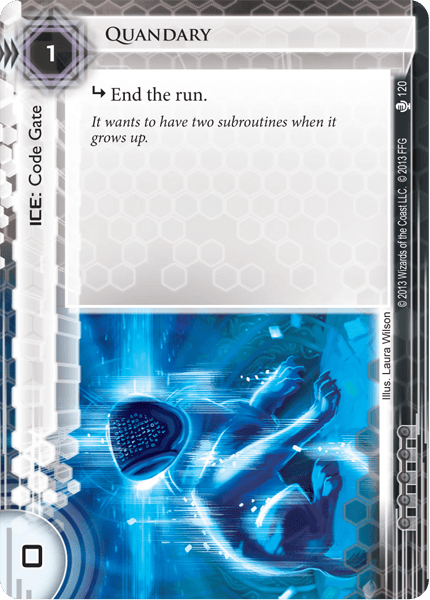 Similar cards: Demolition Run, Imp. This card is pretty obviously weak, especially because the one card that most give you trouble at protecting the remote server is Caprice Nisei, and Demolition Run doesn’t help you at all against her, because she simply ends the run first. I don’t anticipate a format where we are so tormented by Ash and similar effects that we need to play a 4 cost Double event to deal with them, and then run Archives to fetch the agenda. If you are looking to avoid traps, a simple Infiltration is far better in most cases. If you are looking to save money on trashing remote server assets and upgrades, Imp is the solution. Note that the ‘combo’ of Singularity + Copycat to move you into R&D, and trash it all, does NOT work, because it is ruled that this no longer counts as a ‘successful run on a remote server’ from the text of singularity. Verdict: You can safely ignore this card. It is overcosted, and unless your meta is that you play against only one opponent and he likes to put 5 upgrades in the same remote server, there isn’t really a use for this. Similar cards: Lucky Find, Sure Gamble. Queen’s Gambit is a useful economy card for Anarchs, providing $6 for 2 clicks and a card. However, it comes with a couple qualifications. First, you can only play it if the opponent installs a card in a remote server, and you are pretty sure that it’s not an agenda. It’s a great card to play after you scout the opponent’s SanSan, Jackson, Pad Campaign, etc, and decide not to trash it. (Though, if you have to do this, it can lover the card’s efficiency). If you play against a dedicated ‘no-remote’ deck, such as some Cerebral Imaging lists, it’s not playable! If you mess up and target an agenda, it’s really terrible. If the opponent plays Trick of Light, you gave them free counters to use for it. Every once in a while there is a niche use for the card, such as making it so you cannot access a trap, and then running that server and killing the SanSan that the trap was guarding, however these cases are pretty rare so they don’t really impact the value of the card in my mind. Verdict: Overall, it’s an interesting economy option for Anarchs. Any time you find some upgrade that you don’t care about, you can load it up with counters and make money. However, other factions should not pay 3 influence to splash it, because Lucky Find is a better card (it’s basically the same thing but without the drawbacks), and would cost them only 2 influence. Without having played it, it’s hard to tell how frequent those drawbacks will rear their head. Maybe this card is actually bad because it’s way too hard to use. Needs to be tested. Similar cards: Cyberfeeder, other Stealth Chips. An interesting economy card that works similarly to Cyberfeeder, for cheaper, but without the ability to play Viruses. I would think that a virus based Anarch deck would rather play Cyberfeeder over this, and that most other factions wouldn’t bother spending 3 influence to splash this. Still, there may be some use for this card, especially once the Stealth Fracter comes out. 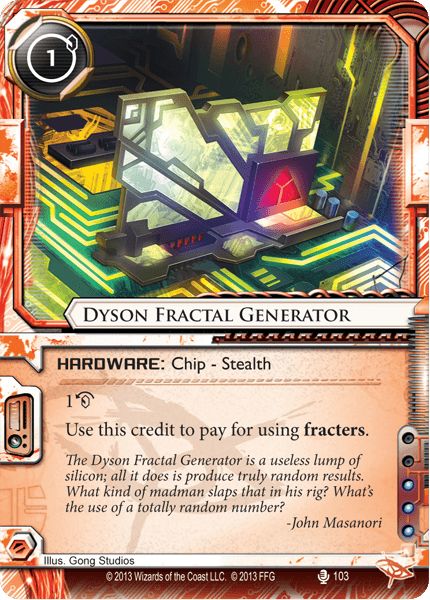 Dyson Fractal Generator provides one additional benefit of note, which is that it protects more important cards from Power Shutdown. Verdict: I don’t see a clear use for this card at present, but I do expect it to eventually have some value. Obviously the card that it mainly combos with is not yet released, and thus we cannot really tell its true power yet. 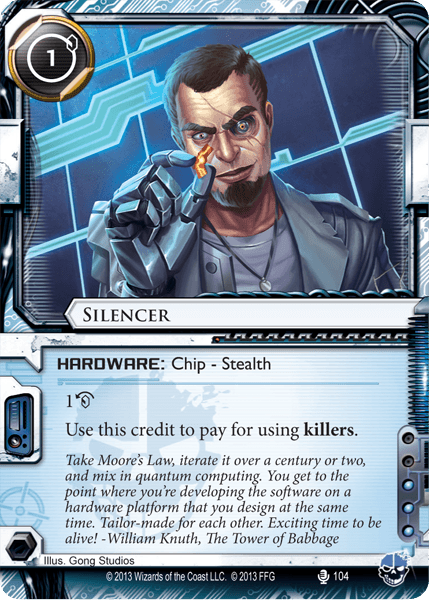 Unlike fractal generator, I expect Silencer to start seeing some play right away. The main reason for this is that Criminal decks are often highly vulnerable to Power Shutdown. Losing your Corroder can be devastating to a criminal deck, and if Andromeda loses her Datasuckers it can hurt a lot. Tutoring up a needed breaker and having it killed right away can lead to a loss. 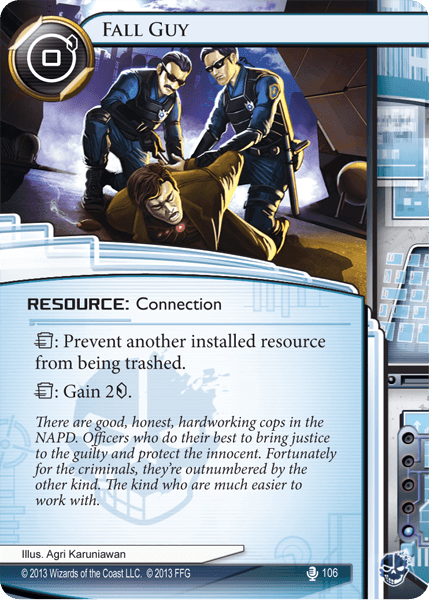 For this reason, I had been considering a couple ‘bad’ cards like Cortez Chip in my criminal decks, simply to protect the Datasuckers and Corroder! But Silencer does a MUCH better job of fulfilling this role, by providing a relevant ability. 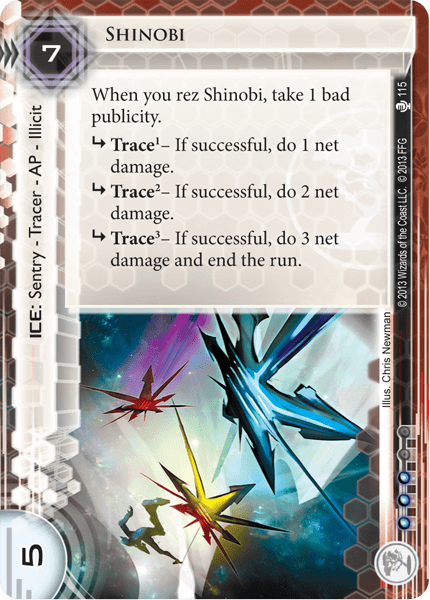 Silencer works very well with Femme Fatale, allowing you to get a discount on her bypass ability, and makes Faeries break even bigger ice for free, enhancing their effect of actually being an economy card. Finally, Silencer allows you to splash Dagger as a 1-of tutor target in Criminal decks, which ends up being a substantial upgrade over Ninja if combined with Silencers. Silencer + Dagger combine to be very strong against the most dangerous sentries. Against Rototurret, it protects you from program loss automatically. Against Grim, a single Silencer allows you to break the Grim for only 1 real credit! Against Archer, you need 1 Datasucker counter, a Silencer credit, and $4 (or 2 silencers). The Spin Cycle as a whole has given very little to the top runner decks. Andromeda received either nothing, or Lawyer Up, depending on whether you like it. Gabe received Knight and that’s pretty much it. But I feel that Silencer actually has the potential to break into the most competitive runner decks. With 1 Dagger + some Silencers, you spend 2 influence getting a more efficient sentry breaker, and you gain some long term run cost discounts, and resistance to Power Shutdown! Verdict: I plan to test Silencers + 1 Dagger in my criminals. Even if the Dagger ends up not being worth it, the Silencers might stay, because guarding against Power Shutdown killing my Corroder is a big deal. 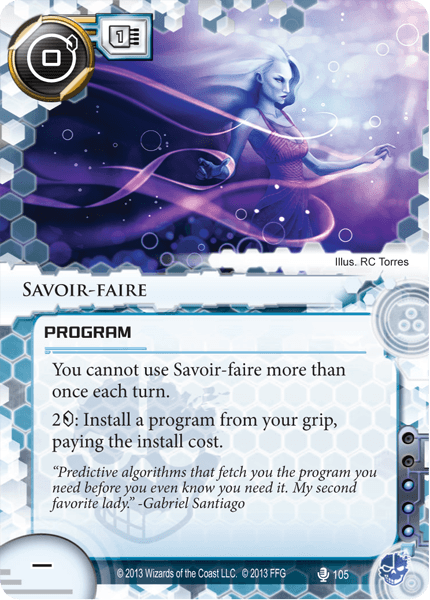 Savoir Faire is an interesting way to get instant-speed programs in your criminal deck, without spending influence. It combos well with Stimhack, and with Bad Publicity. However, unlike Personal Workshop, it doesn’t provide an economy benefit, and actually imposes a small cost. You pay an extra $2 to get the program out, though you do save a Click. Usually $2 is a bit better than a click, but not all that much better, so the cost is minor. I considered the potential for an Omni-Drived Savoir-Faire to allow you to convert $1 into a click to install programs, but that costs too much influence and doesn’t seem useful enough. Savoir-Faire could potentially provide you with bonus Scheherezade money, and be pawned for $3 or used to guard against a Shutdown, increasing its usefulness. It is likely that this card will eventually become unneeded, once you get your rig out and need to free up the memory, so having a way to gain more value from it at that time makes it a lot more usable. Verdict: Instant Speed program installation is useful, but I’m not sure if this card is good enough to justify it. I definitely wouldn’t splash this into non-criminals. It eats up MU while simply not providing nearly as much benefit as a Personal Workshop, but it does combo with Stimhack. I suspect that it’s not good enough, but perhaps a criminal deck will be desperate enough for 0-influence instant speed installation to include it. Similar Cards: Easy Mark, Tag avoidance. Fall Guy is interesting, as he makes it a lot less likely that you will get your Kati Jones destroyed by a surprise tag, with all the money on her. He also is going to combo well with the spoiled ‘Calling in Favors’, which will give you $1 per connection. (Other connections: Kati Jones, Pro Contacts, Underworld Contacts, Compromised Employee, etc). I expect there to be a resulting deck that uses tons of connections and plays this card. That deck might even be good! And there is some room to use this card as Kati protection, to help guard against an unexpected tag. A single Fall Guy will allow you to not worry about your Kati dying to an NBN Breaking News + Fast Advance->Trash combo. It’s usually hard for NBN to score the Breaking News with more than 1 click remaining, at which point they won’t be able to actually kill the Kati due to Fall Guy protection. Another use for Fall Guy is simply to be annoying to the corp and deny them money and clicks. For example, a Data Leak Reversal in play against a poor corp is pretty painful, it can require an entire turn in order to kill it. If you also have Fall Guy, that’s ANOTHER 0 cost resource that the corp must spend $2 and a click killing! Note that a Character Assassination will still kill your Kati, even if you have this, because it says the trash is unpreventable! However, that doesn’t matter because pretty much every deck that was using Character Assassination before will now use NAPD contract. 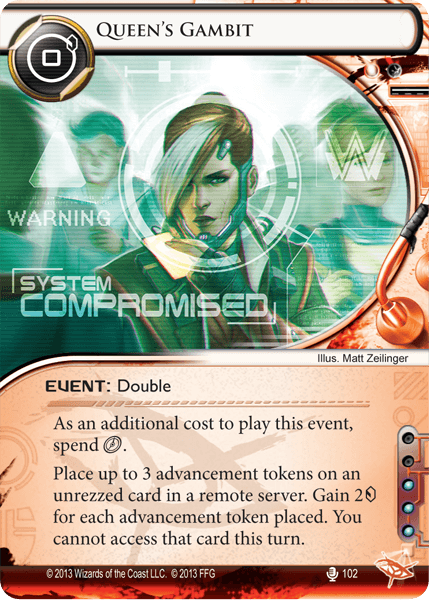 Verdict: This will see play in the upcoming Connections deck, and it’s quite reasonable already as a way to protect your Kati, or to extend the life of annoying Data Leak Reversals. This card is pretty decent in the right decks, and it’s pretty clear what decks would want it and what wouldn’t. This is a pretty binary card. Essentially, you make the deck that uses lots of Doubles. Either that deck is good, or it isn’t. If that deck is good, then this card is good, and it goes in that deck, and nothing else. If that deck is bad, then this card is playable in nothing, and is terrible. Given that we don’t know yet if that deck will be good, (what future doubles will they make? Will any of those help the deck? ), it’s hard to know if this card is worth it. My gut leans towards no, at least for now. There just aren’t enough good doubles yet. Basically there is Lucky Find, Hostage, Lawyer Up, Queen’s Gambit. And Eureka, if you play some kind of Motivation + Eureka deck. Pretty much any combination of those cards is using up a bunch of your influence. Verdict: I expect this to be weak, at least until some future date when more strong double events are released. There is a big problem with trying to build a deck around this right now, which is that all the good double events, and/or this card, are going to cost you influence to include. Paintbrush allows one of your breakers to turn into a super-Crypsis. At a cost of 1 click per ice you want it to go through (like Crypsis), you can turn another breaker (with a high strength and/or low cost to break), into a super-Crypsis. Yog on a Dinosaurus, plus Paintbrush? Go through any ice of 5 or less strength at a cost of 1 click! Paintbrush + Torch? Paintbrush essentially changes your rig from needing 3 separate breakers, into ‘Paintbrush + 1 efficient breaker’. Having 1 breaker that can reliably get through any ice is pretty strong, that’s why Crypsis is a good card even though he is inefficient. And the Paintbrush super-breaker isn’t even that inefficient! While it does cost a lot of MU (2 for Paintbrush, 1 more for the breaker), it fulfills your entire rig in one card. The super-breaker you create will now break one type of ice very efficiently, and the other two at a cost of just one more click per ice. If the super-breaker is a ‘retains strength boosts’ type breaker, like Gordian Blade, then you can use it on a whole ice fort! I expect to see this card as a staple in Kit decks. Perhaps it will finally make Kit into a powerhouse. I think it’s quite playable in other identities as well. Because Kit already wants a big, efficient code gate breaker, and already turns things into code gates, it’s a lot easier for her to use it. I have given Paintbrush an uncertainty rating of ‘high’, because it’s hard to know whether this is actually the GREATEST THING EVER in terms of a versatile rig, or if having to spend all your clicks tinkering ice ends up not being worth it. However, it IS similar to Crypsis, and Crypsis IS a good card, and Paintbrush will actually be more efficient than Crypsis! At this point, I should also discuss the card’s drawback. It doesn’t work on unrezzed ice. 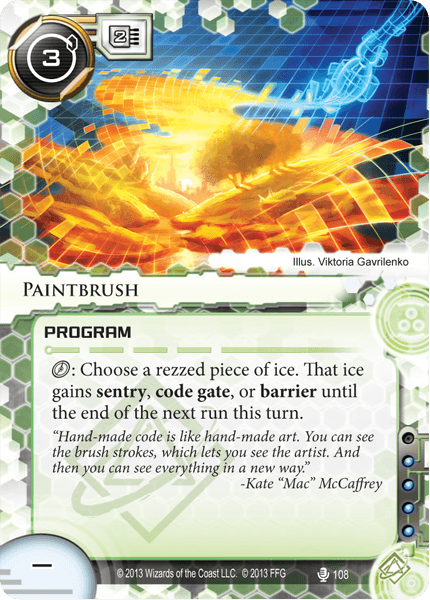 That’s a pretty big deal, because the unrezzed ice in question could be Rototurret, Grim, or Archer, and trash your Paintbrush! As a result, I expect that Paintbrush decks are going to play multiple copies of Sharpshooter to guard against this problem. Also, I would recommend a backup Fracter program to help deal with things like Wraparound, and simply to reduce the number of things that you have to waste clicks on, and that can stop you when they are first rezzed. After all, going through a big remote server only to be stopped by the previously-unrezzed Ice Wall at the end will be quite annoying. Throw an Inti into the rig and it reduces the drawbacks of Paintbrush greatly, at a minimal cost. Due to its click costs, Paintbrush supports a strategy in which you make one efficient run per turn, but cannot really make multiple runs. Therefore, it is best in a deck that tries to make individual impactful runs, for example, decks that use R*D interface of Maker’s Eye, not decks that use Medium or Indexing. Verdict: I expect it to be good, and see play. I’m not sure if it will be the HUGE new thing, like Atman was, or simply a thing that you see occasionally because it turns out to be unreliable, and the ‘not usable on unrezzed ice’ thing a big drawback. I definitely would recommend that you make a Paintbrush deck and try it out. It’s unclear to me how easy it will be for runner players to work around the drawback, and that will be the deciding factor of whether this is amazing or simply ok.
Lucky Find is awesome, it’s a super Sure Gamble. The only problem is the 2 influence cost. I see Lucky find as a 4.5/5 card that is weakened by its influence cost, which makes it hard to fit into decks. The best way to think about Lucky Find it is a Magnum Opus click, followed by playing a Sure Gamble. (That analogy works perfectly, because it works from an initial start of $3. I include this to fend off the inevitable idiot who will comment that I ‘didn’t mention that Lucky Find can be played from a lower amount of credits than Sure Gamble’). We know that Sure Gamble is great, and helps greatly at getting your development going quickly. We know that clicking an Opus without having to actually spend the effort to get an Opus into play would be great. So the result of this card is quite solid. Anyone who has played Netrunner at all will understand the benefit of having Sure Gamble in your opening hand. Hands with Sure Gamble just generally work better than hands without it, because it makes it very easy to afford the cards in your hand, and thus be able to draw more cards without having to discard anything. Lucky Find has the same effect, and because it essentially gives you more Sure Gambles in your deck, it makes more starting hands into ‘good hands’, where you can afford to play out your cards and then you are free to draw more. The only drawback, of course, is the 2 influence cost. 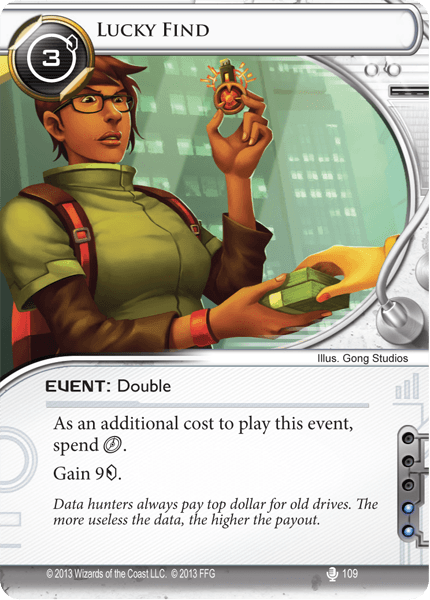 Lucky Find imposes a cost to you during deck building, and then is always great during the game itself (though perhaps not as good as something else you might have spent influence on). For any deck where there aren’t that many critical things that you need to spend influence on, Lucky Find is a great use of influence. As a general rule, I feel that any time you don’t know what to spend some of your influence on for a deck, you can just fill out the influence with Lucky Finds, and it will be good. That said, finding 2 spare influence for many of the competitive decks out there is HARD. Forcing you to make that sacrifice will likely prevent many people from utilizing the benefit of Lucky Find, which probably will make it see a lot less play than it might otherwise. Verdict: I see a lot of underestimation of how beneficial Lucky Find actually is. Its actually superior to Sure Gamble, not factoring in the influence cost. It’s a strong card for any deck with spare influence. It warrants some playtesting time to take current strong decks, cut out whatever things they are spending influence on that are the least important, and putting Lucky Finds in their place. The consistently solid starts provided by Lucky Find may outweigh the benefits of those other cards, but this needs testing on an individual basis. When you play Lucky Find, you pay part of its costs during deck construction. Similar Cards: Neural Katana, other bad code gates that don’t end the run yet wrecked by Yog, other damage cards. I think Gyri Labyrinth is weak. Unless it results in a kill combo on the runner, it pretty much does nothing. It might cause the runner to have to discard a couple cards, however this is worse than dealing damage because the runner gets to choose. In combination with enough Brain damage, Gyri Labyrinth will kill the runner. However, this is true for ANY damage source. In combination with Brain damage, Snare, Neural Katana, more Brain damage, etc, will all kill the runner. So who is going to use this card? Jinteki has access to better sources of damage than this. If they were looking for good cards that cost them influence to help out with getting a kill, they will probably be more interested in things like Scorched Earth, Fenris, Cerebral Overwriter, etc. Weyland would rather get Snares. In the end, an HB damage deck is the only thing that would consider this, and as of yet I haven’t seen any really viable HB damage builds. Compare Gyri Labyrinth to Neural Katana. Gyri costs less, but it does 2 “damage” instead of 3, and the damage only happens if they are near their max hand size, and the discards caused are of the runner’s choice. Additionally, Gyri is destroyed by Yog, while Neural Katana is a lot more relevant against most sentry breakers (though Mimic gets through for 1). There is some room for Gyri to see play in a deck with the upcoming Jinteki executive that also lowers hand size by 2. Get a couple brain damage on the runner, wait for them to run into Gyri without a breaker, and then rez him for 2 more handsize reduction. Maybe follow up with Neural EMPs if needed. Verdict: In general, pieces of ice that don’t usually do anything, expect in specific instances where they actually work, are generally quite bad. I don’t think Gyri Labyrinth is any different. Its kill potential exists, but is probably lower than Neural Katana, and when it doesn’t result in a kill, it won’t really do much. Here is my short summary of Gyri Labyrinth: Early on, your opponent doesn’t have Yog, but you don’t have your combo of cards to kill the runner yet, so it does nothing. Later on, the opponent has Yog, so it does nothing. Now, that might be a bit oversimplifying things/overly harsh, but not by much. Its pretty hard to get Gyri to work. 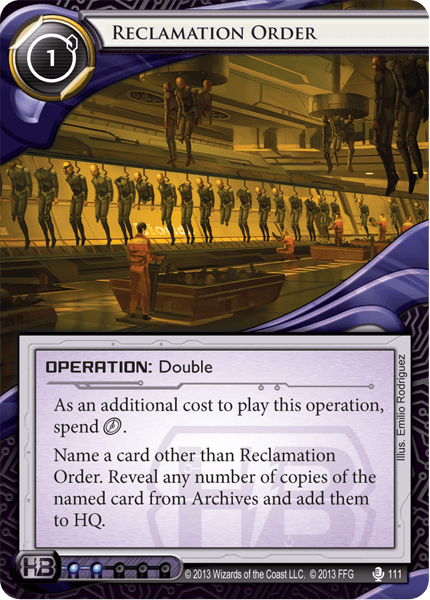 Reclamation Order is a really big Archived Memories that gets back all the copies of a card. That’s often not worth it, because it’s hard to get all 3 copies of something into your archives. Unlike Archived Memories, it’s not going to be useful for most of the game, and it’s not usable as a way to play Scorch-Archived-Scorch for a kill, because it’s a double. However, I see a couple possible uses for this card. First of all, maybe you have a very slow and controlling Biotic Labor based deck, which simply never makes a remote, and Biotics EVERYTHING. One copy of this card can ensure that you don’t ever run out of them. (That might work for some Cerebral Imaging builds). Secondly, an Accelerated Diagnostics combo could play this as a way to get multiple copies of a card back at once, essentially providing more value than Archived Memories. This might lead to some more extended Diagnostics combo than would be possible without it. Verdict: I’ve already seen people have some success with this card in Cerebral Imaging, and claim that it was superior to Archived Memories in that deck. But in other decks its often worse than Archived Memories. (For example, it doesn’t allow Scorch-Archived-Scorch combos, unless you add a Biotic Labor). It might also find a place in Accelerated Diagnostics combos, but those haven’t turned out to be a big deal so far. I feel that it has a place, but only in certain decks. Expected Power: Depends on if it works with Profiteering, but probably not all that amazing. 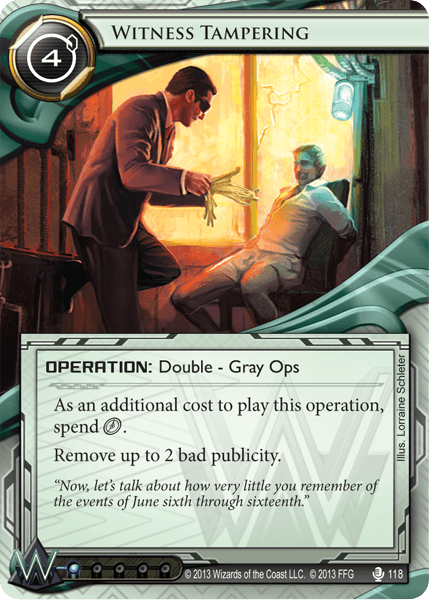 So this card allows you to impose a cost on the runner if they want to give you a Bad Publicity. For a Making News deck, it will cost them $5, or less if they have link. If your corp has an actual plan to give them bad publicity and then avoid it, this might be good. Rezzing a Grim and baking the runner pay $5 if they want the Bad Pub is certainly decent. However, there really aren’t any other decent illicit ice to use it on. There is debate over whether this card works in combination with Profiteering. 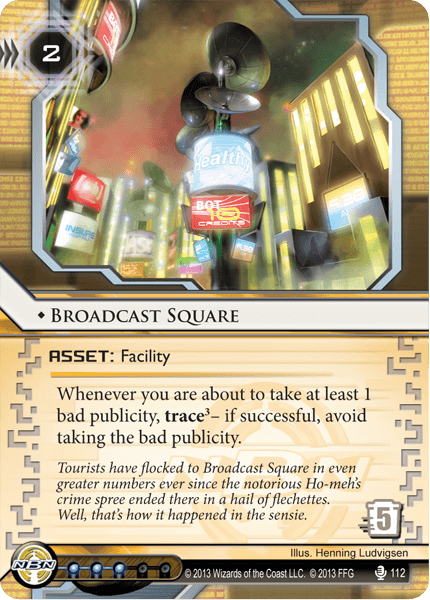 If, as some people read it, you can take $15 with profiteering, and then use Broadcast Square to avoid the Bad Publicity, then this card could have a place in that strategy. Unfortunately, this card isn’t a good way to avoid the Bad Publicity from the Activist Support + NACH + Blackmail combo deck. (A deck which is hard countered by certain corp cards like Clone Retirement, bad pub removal, but which can be strong and frustrating to play against for certain corp strategies, since it eventually makes all your ice meaningless). This combo deck would simply pay to beat the broadcast square trace once. Finally, you can use this in a deck running Subliminal Messaging, against a meta which featured lots of people playing Tallie Perrault. That’s not the current meta, but if it developed, there might be a place for this card. Verdict: The only really good and worthwhile use for this card that I see is if it works with Profiteering. So for the actual rating of this card, I think we have to await a ruling. Similar Cards: Jackson Howard, Anonymous Tip, Rework. Corporate shuffle is an interesting and potentially powerful effect, however, it tends to do the same thing that Jackson Howard does, and Jackson probably does it better. This is a card that I could see myself playing a lot more if Jackson didn’t exist. Make a deck with lots of burst economy. Draw cards and play the burst economy and ice. Corporate shuffle the remaining cards in your hand (agendas) back into your deck, and get new cards. This is essentially the plan that Cerebral Imaging uses, except that instead of the ‘throw all those agendas back into the deck with Shuffle’ step, it simply holds them all in a huge hand. Corporate Shuffle might allow NBN to play “The Cerebral Imaging Plan”. That is: use card draw effects, play strong burst economy cards to generate money quickly. Ignore hand size limitations. Verdict: I see solid potential in this card, but it also overlaps Jackson Howard in its use. If it’s simply an inferior version of Jackson then there isn’t room for it. But if the playstyle outlined above proves effective, maybe it will become a staple card. It is quite possible that this card is good but never gets played because of Jackson. Given the length of my discussion on Caprice Nisei, I have moved her to the end. I will rate the rest of the cards first, and then discuss Caprice. Once again, we get an illicit ice that can be good if you are rich and the runner is broke, but in more realistic scenarios is overcosted. It’s better than muckraker because if it works, it could actually kill the runner, and maybe that will happen occasionally, against a really desperate runner. Expensive ice with several small traces get ruined pretty hard by even a couple link, and all of the top runners other than Gabe have a base link. Verdict: Probably avoid this one, there are many better any more efficient ice options available. If you are going to play this and try for a kill, it should probably be in rich corp decks with Closed Accounts. This is much worse than Sensei, as it is easy to break and also gives the runner an out if they can’t break it. There is simply no place for this codegate in a world where we have Quandary, Yagura, and the upcoming Inazuma. Verdict: Worthless, we have much better cheap codegate options now. In what might be the most controversial rating of this guide, I have given Hive an extremely high rating. Initially when Hive was spoiled, I thought it would be good. When Double Time came out on OCTGN, I tried hive in several decks right away. I tried it in an NBN Midseason deck, and it was AMAZING. I tried it in a Weyland Scorch deck, and it was AMAZING. And I played against a friend who tried in in Cerebral Imaging, and it was simply the greatest possible ice that Cerebral Imaging could want. Essentially, Hive completely blew me away. What I expected to be a good ice was clearly great, maybe even the best ice since core set. There are many decks that benefit greatly from an ice that is very powerful early on, when you don’t yet have points, and that don’t really care all that much if it falls off later. Hive is essentially a $5 ice that (before you have points) protects you BETTER than an $8 ice would (unless the opponent has Morningstar). Let’s take a look at some decks that want Hive. First of all NBN. In most NBN decks there is one overarching concern that dominates all other factors in the game. That is: can I score my first Astroscript? Score the Astro, and you are in a strong position. Now you can Astro chain. Have that first Astro stolen, and you’re very sad. 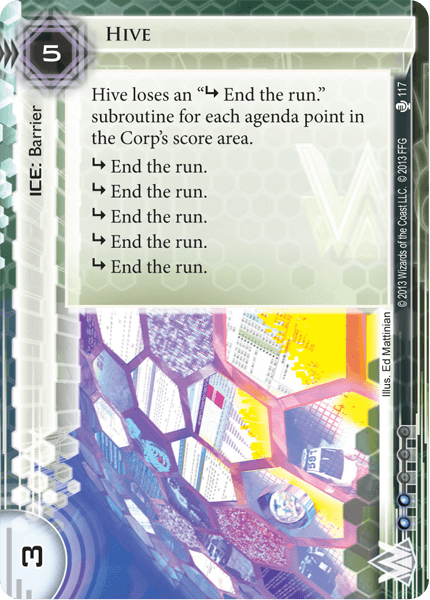 Hive does the BEST job of guarding that first Astro of any ice, ever, at least in a meta which does not feature Morningstar. It’s tough to break ($6 for Corroder), can’t be clicked through, and isn’t vulnerable to Femme. At a cost of just $5, it protects you about as well as a Tollbooth. In my first play with Hive, I put it out, and my opponent played a Self-Modifying Code and ran. How much would it cost to use the Self-Mod to get a Corroder, and break it? $10, which proved just barely too much! Hive is excellent for kill decks, which focus on Scorching the runner out, rather than scoring a points. Consider a Weyland deck that would forfeit its agendas to Archers, and is looking to survive while it assembles its Sea+2xScorch+Money combo. Hive is amazing for this deck at defending any server you want, and if the runner does run through it, it helps to ensure that they were sufficiently drained and are vulnerable to your kill. Hive is great in rush decks, where the goal is to normal-advance the first few points, and then once the runner is able to stop you from scoring more, fast advance the rest. The fact that Hive got weaker during that final phase of the game isn’t a big deal. Hive is great in a Cerebral Imaging deck that would love nothing more than to wall up HQ and R&D tight, never make a remote server, and never score a point for a long period of time, until it eventually starts Biotic Laboring everything from its hand. Those 5 subroutines will stay around for the majority of the game. That said, Hive has one major weakness: Parasite. It’s not as bad in this respect as Tsurugi, but it’s still $5 for a 3 strength ice, which could die pretty fast to a Parasite. (Probably not an instant parasite though, so it might get at least one stop first). In the current competitive meta, there are two main types of runner decks. There are Criminal decks that Siphon you, and there are Anarch and Shaper decks that Parasite you, and recur the parasites. (Yes, there is some overlap, and some decks do both). Generally however, Gabe and Andy don’t parasite you, while Anarchs and Shapers do. From the data we have of tournament play, in most metas, criminals make up about 55% of decks, with Shapers most of the rest. Not all of the shapers use parasites, but many do. In general, probably 33-40% of decks right now are using Parasite, so this weakness of Hive is a moderate weakness. If the meta were to change, for example, if there were a resurgence of Anarchs, and Katman-like shapers, and criminals became less popular, this drawback would become more significant. Still, it’s not like Hive is THAT much worse against Parasite than a Wall of Static. You lose $2 more, and get a bit more benefit if they can’t kill it immediately. Verdict: Hive is amazing and should see play in many decks. Most especially in decks that don’t focus on scoring points in order to win, or decks that are heavily invested in the success of their early rush, with the plan to fast advance things to finish the game later on. Witness Tampering is pretty much a more expensive version of bad publicity removal than we have already. I don’t really see a place for a $4 cost double action to remove bad pub. Verdict: There are more efficient ways to remove bad publicity. Similar Cards: Red Herrings, Fetal AI. I have awaited NAPD contract ever since it was spoiled, and my initial experiences with it have even exceeded my expectations. The built in Red Herrings effect on this card not only makes it much easier to score in some situations, but it really helps to blunt early attacks on your central servers. In my first experience running against NAPD, early on I ran R&D. My opponent rezzed Eli, and I decided to click through. I saw an NAPD contract, paid for it, and then sat there helpless to stop an Astroscript that came out the next turn. I essentially got wrecked by hitting an agenda! 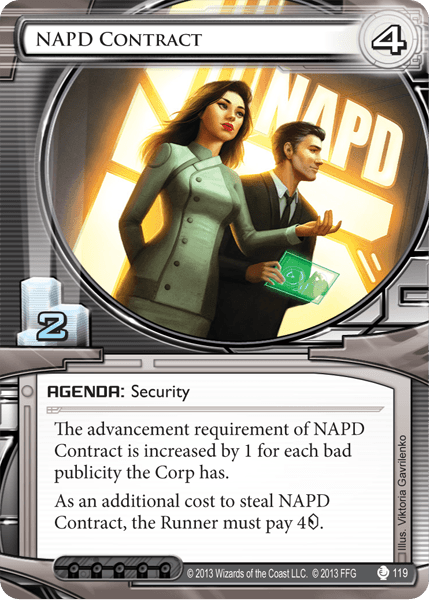 I think that NAPD contract will become the default filler agenda for almost all decks that you put in to get to 20 agenda points, after you include your good 3/2 agendas and things you actually want to score. Most decks rarely score those 4/2s that they are forced to fill out their deck with anyway, so making them cost the runner $4 to steal is pure upside over whatever else would’ve been in that agenda slot. Verdict: I can pretty comfortably say that I’ll be playing this in pretty much everything from now on. It really is that good. Also, the penalty for having Bad Publicity doesn’t make me want to play this card in Bad Pub decks, it simply makes me not want to play Bad Pub decks. Quandary is the code gate version of Ice Wall, and it will go in most decks and be quite solid. It essentially saves you $2 over rezzing Enigma. It is almost equal to Enigma against the relevant breakers as well, since Yog crushes both of them, and Gordian Blade is equivalent if you run on the last click. The main difference is against AI breakers. Forcing a Yog with a 1 cost ice is a pretty good thing actually, so I don’t think you could really claim that Quandary is ‘weak’ against Yog. I imagine that in the future, many decks Code Gate mixtures will be nothing but Quandary and Inazumas, and perhaps Yog will become a lot weaker? One can dream. Verdict: Quandary dreams of growing up to become Enigma, but it shouldn’t. It is stronger in its Juvenile form. This is a solid and universally good card that will be seen in most decks. It’s similar to Ice Wall, but neutral! I think that if this cost 1 influence it would STILL see a lot of play, so it’s pretty clearly great. 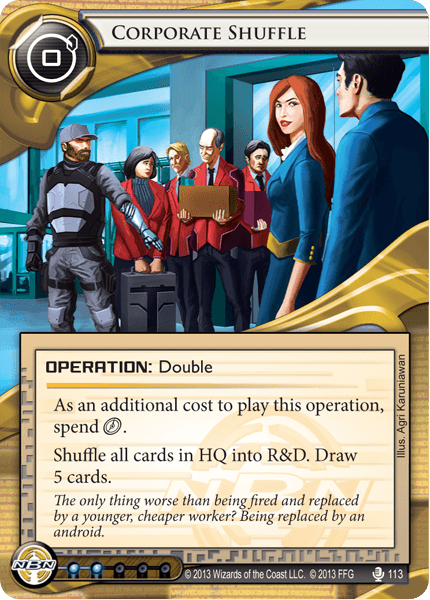 Similar Cards: Ash, Corporate Troubleshooter? (But with randomness instead of the corp plowing a bunch of money into stopping you). Alright, with that out of the way, in a mostly but not completely joking way, Caprice is pretty clearly a strong card, but at this point it’s really hard to tell what her impact will be. 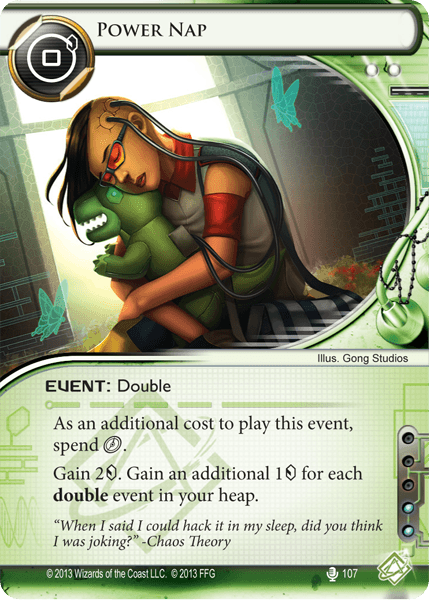 The end result of Caprice could lie anywhere from “nobody manages to make a competitive deck out of her because 4 influence is a lot, and Jinteki isn’t good enough” to “ruins Netrunner”, and without a lot of testing I don’t think we can really predict what will actually happen. In order to visualize the effect of Caprice Nisei, lets first imagine a modification to her. 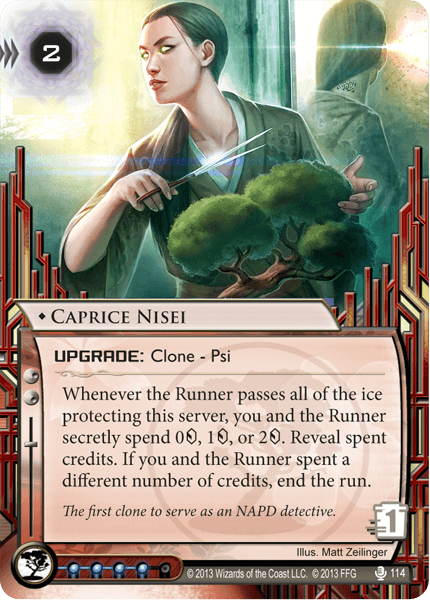 Pretend for a minute that Caprice Nisei instead says “whenever the runner passes the last piece of ice guarding this server, trash Caprice Nisei and End the Run”. This card would be like a Super-Ash. For $2 to rez her, she stops the runner once, and even counters special runs like Account Siphon. She would be like a Troubleshooter that the corp doesn’t have to spend a lot of money on. No need to out-economy the runner. That would be a powerful effect! And the more ice you stick in front of her, the better it gets. The real Caprice Nisei isn’t exactly like that. Instead, there is this Psi “mindgame” mechanic, which is essentially a Rock-Paper-Scissors game, and for 2 in 3 outcomes the corp “wins” the exchange, ending the run AND keeping Caprice around, and for 1 in 3 outcomes the runner “wins” the exchange, continues on, and gets to trashes Caprice. Higher variance. Either Caprice doesn’t work at all (doesn’t end the run AND is trashed), or she works amazingly well (Ends the Run AND loves to try it again). Higher expectation value. On average, due to the Psi mechanic being weighted in the corp’s favor, Caprice Nisei will end the run an average of TWO times, before she goes away. (Out of three runs we expect an average of one ‘goes away’ result and two ‘end the run’ results. This analysis shows us the potential problem that Caprice brings to the game. First off, the variance she provides is at a level that is extremely unpalatable to many people’s gaming tastes. She either ends up doing nothing, or she does something REALLY strong, possibly MULTIPLE TIMES! When that scenario does occur, and you are the runner, and caprice stops your run several times, what is that going to feel like? It will just be the worst feeling ever. Alright, lets discuss the Psi mechanic now. After all, Caprice isn’t simply ‘2/3 chance of end the run’. This topic is probably worthy of a post in and of itself! The Psi mechanic is essentially a weighted game of Rock-Paper-Scissors. RPS is a good baseline for describing what is happening, so I will use it. The first difference is that while in RPS, there are 1/3 wins, 1/3 losses, and 1/3 draws, where both players chose the same item, now we have 2/3 corp wins and 1/3 runner wins, and no draws. Additionally, there are different costs to use the different choices (Rock, Paper, and Scissors). Essentially, the different options cost $0, $1, and $2. What this means is that our payoff matrix changes, depending on the importance of ‘Ending the Run’. In one extreme case, the payout for success in the Psi-mindgame could be victory in the game. That is, Caprice is guarding a game winning agenda, and the runner cannot afford to break in again, and if they don’t get it (and win immediately),then the corp will score it (and win). This is the highest possible payoff situation. In this scenario, the correct strategy for the corp, provided that both players have at least $2, is to choose either 0, 1, or 2 with 1/3 probability each. Since the value of winning the mindgame is essentially infinite, the differences between 0, 1, and 2 are irrelevant. For the runner player, knowing this, they will essentially have a 1 in 3 chance of guessing the same number as the corp player is randomly choosing. First of all: Yes, this is a skill that it is possible to have. After all, people have programmed AIs to play rock paper scissors that will figure out patterns in your “random” choices, and then exploit them to beat you more often that they should. Of course, the fact that some AI programs have this skill, doesn’t mean your average Netrunner player does. However, even if you do have this skill, there is a problem of applying it to the Psi Mindgame. That is, the ability to predict your opponent’s “random” choices depends on iterating over a number of plays of the mindgame, in order to detect patterns! 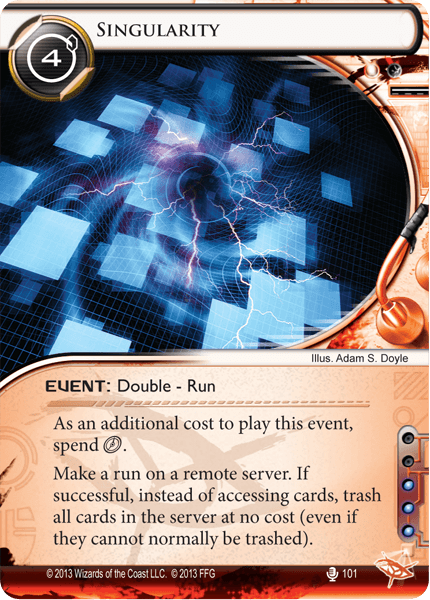 However, how many times will you actually play the mindgame during one single Netrunner game? Not much. And if you DID play it a bunch of times, that would mean that caprice is working over and over again, at which point the runner is going to get crushed! So essentially, every mindgame that it takes you as the runner before you get in and kill caprice imposes a big cost! And it takes at least a little time to figure out your opponent’s pattern. Secondly: Even if you DO have the skill of figuring out my brain’s random number generator, AND you can do it quickly, I can easily defeat that method by simply rolling a die and using the result to make my choice. Now I have no pattern, and we are back to pure 1 in 3 chance! To this, some people respond that it is “against the spirit of the game” or should be “banned”. This is a pretty ridiculous statement to me for several reasons. First off, there is nothing in the rules that indicates in any way that this is not allowed. But even more importantly, even if you didn’t let me use dice, I can still find other random mechanics to use, and there is no way for you to know that I am using them. For example, I could sum up the values of certain features on the cards in my hand, and take the result modulo 3, and then bid that amount of credits, and you won’t know that I am doing that. Essentially, in a situation where the stakes are very high, the result of the Caprice Psi mindgame is going to be 2/3 win for corp, 1/3 win for runner, and there is no strategy for you to improve your chances (predicting my randomness) that I cannot foil in some way. At the other extreme, we have a scenario where getting to Caprice costs you only the click to make the run (there are no ice guarding her, or they are free for you to break). At that extreme, the costs of the credits paid by the players are going to be a BIG factor in the net result. If the corp pays $2, and the runner pays $0, then by our previous definitions, the corp “wins”, but in reality, the runner has won by spending a click to deny $2 to the corp player, which is probably a net win for them. The result that this has on the mindgame is to make it so that we should weight a $0 result more heavily in our probabilities. That is, both players are incentivized to choose $0 more often, and thus the runner ends up winning more than 1/3 of the time. Most cases in actual gameplay will fall between these two extremes. For example, the result of this one psi-game will not determine the entire game. 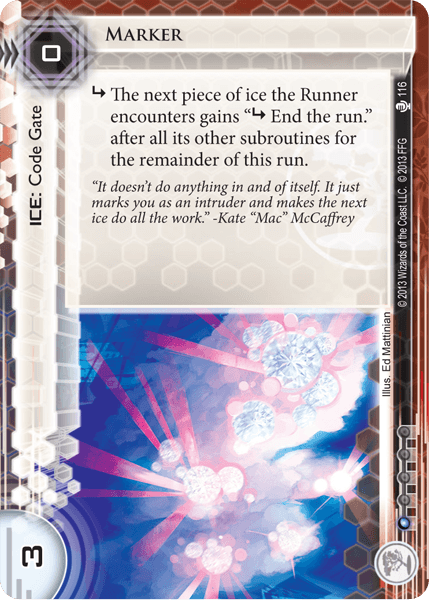 It probably costs a moderate amount for the runner to get in again and initiate another psi-game, based on how much it costs them to break the couple of ice guarding caprice. In this scenario, “winning” the mindgame has a value of $X, and bids on the mindgame cost either $0, $1, or $2. X might be 3 or 5 or 10 or whatever, depending on how defended the server is. In this situation, the correct play is in between our two extremes. The higher X is (the more important it is to get in), the more you should move towards a ‘pick randomly’ strategy, weighting 0, 1, and 2 with equal probability. But because X is not infinite, you would still prefer to pay less credits, so you weight $0 a bit higher, and $2 a bit lower. In practice therefore, because the corp is usually favoring $0 bids slightly over $1 bids, which they favor slightly over $2, the chances for the runner to win the bid are going to be higher than 33% in most scenarios. Thus, the average caprice will tend to stop a bit less than 2 runs before dying. However, she is STILL highly random and high variance. With all that said, it is possible that your Psi-mindgame opponent will have a significant tell when performing Psi-bids, and you might figure it out. Maybe it’s based on the game state. Maybe they just always bid $0 when the stakes are really low and $2 when they are really high. Yes, it is possible that due to a tell, you will be able to outplay your opponent in Psi-mindgames, and win them more than you should. In this manner you could claim them to be “skill based”. To me, however, that is not a good consolation for the high variance they introduce to the game. After all, I can simply roll a die or use some other means of randomly generating a number better than my brain is able to generate random numbers, and then I have negated your skill, and reduced Caprice to randomness. Verdict: Power Level: 5/5. Fun Murdering Potential: 5/5. Variance Level: 5/5. 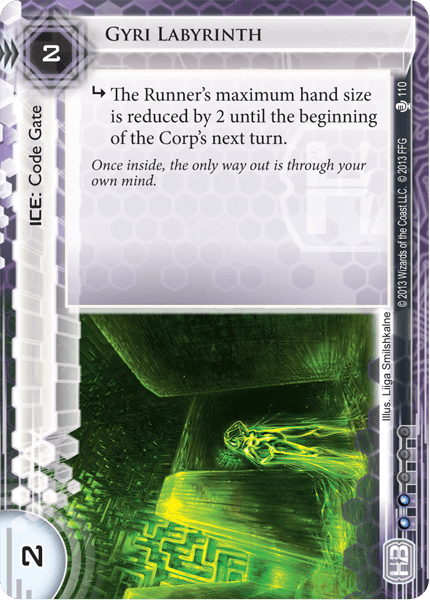 Caprice is the culmination of a move from heavy imbalance in the runner’s favor at the time that C&C was released, to the corps being in the lead at most, if not all, ELO levels. In a cycle which was very strong for corps, in a pack which is very strong for corps, she is the card which gives runners the greatest nightmares. If you made it this far, thanks for reading! !